I have several others but some are in boxes and the frame glass is broken in still others. Today Barb got prices on replacement glass so those will be going up soon. 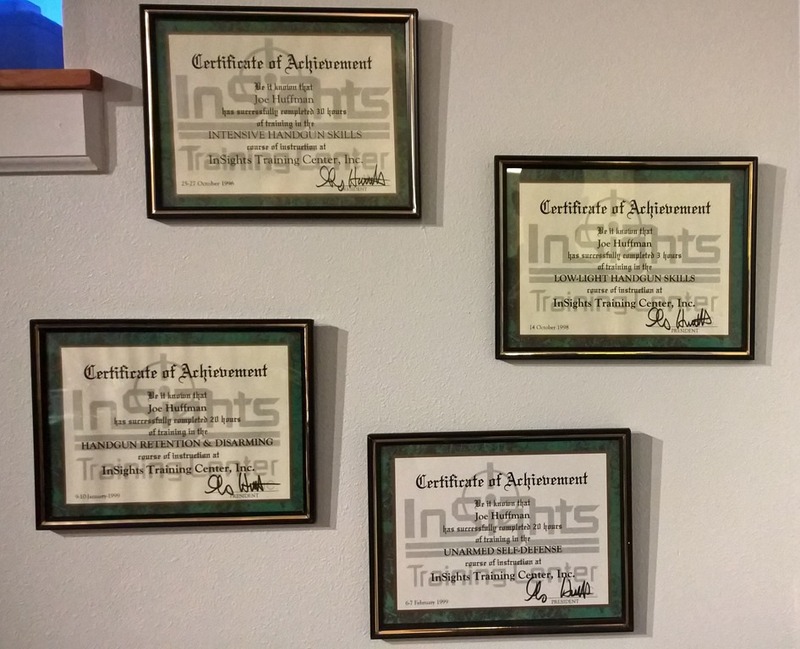 The certificate in the upper left is for Intensive Handgun Skills. The certificate is dated nearly 20 years ago, October 25-27, 1996. I signed up to repeat it on February 20-22, 2016. I figured I need a tune up after so many years. This entry was posted in Gun Fun, Home Life by Joe. Bookmark the permalink. Greg and the guys do offer world-class training here locally. Have you taken any courses from anyone else, Joe? 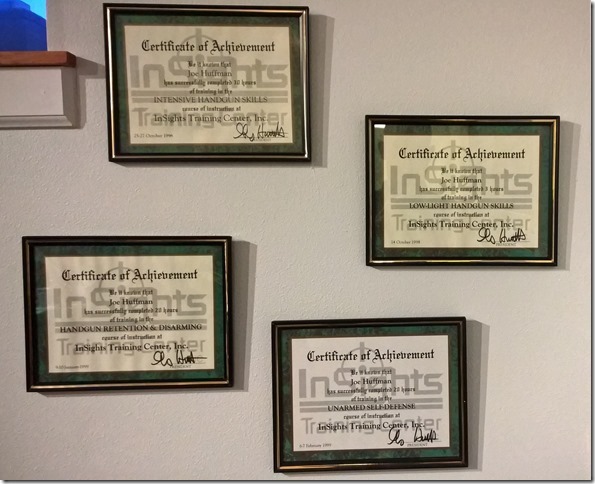 I can highly recommend Jeff Gonzales, Trident Concepts. When I was at MSFT, a bunch of us from the MS Gun Club had him come up several times, and I trained with him again when Tacoma SWAT brought him in and he had a couple of positions open. Of course, Marty Hayes has great training and an excellent facility too – with a bit different perspective from the ex-SF guys. I should retake a handgun and/or carbine course from Greg myself. Do you know if he has any outdoor venues? I’m not a big fan of spending the whole day in a training bay at an indoor range. Of course, there’s always that Econ guy, who offers clinic at some guy’s wheat ranch over in Idaho….